Recently originalization was proposed to be an effective way of duplicate-gene preservation, in which recombination provokes the high frequency of original (or wild-type) allele on both duplicated loci. Because the high frequency of wild-type allele might drive the arising and accumulating of advantageous mutation, it is hypothesized that recombination might enlarge the probability of neofunctionalization (Pneo) of duplicate genes. In this article this hypothesis has been tested theoretically. Results show that through originalization recombination might not only shorten mean time to neofunctionalizaiton, but also enlarge Pneo. Therefore, recombination might facilitate neofunctionalization via originalization. Several extensive applications of these results on genomic evolution have been discussed: 1. Time to nonfunctionalization can be much longer than a few million generations expected before; 2. Homogenization on duplicated loci results from not only gene conversion, but also originalization; 3. Although the rate of advantageous mutation is much small compared with that of degenerative mutation, Pneo cannot be expected to be small. Gene duplication is the most common way of evolving new genes [1–4], but it is still argued how new genes evolve from duplicate genes in detail [5–7]. Ohno (1970) proposed that new genes might be fixed at one of duplicated loci by genetic drift, which was called neofunctionalization. Because degenerative mutations might also be fixed on the duplicated loci (called nonfunctionalization) and the occurring rate of degenerative mutation is usually much larger than that of advantageous mutation, the evolutionary fate of most duplicate genes is nonfunctionalization . However, it has been observed that many duplicate genes are retained in some genomes, such as in tetraploid fish , Xenopus Laevis, and yeast Saccharomyces cerevisiae[4, 11, 12]. So it is necessary to explain these observations reasonably. And Walsh (2003) also suggested that recombination might enlarge Pneo, but he neither provided theoretical evidences, nor gave further explanation or hypothesis . Recently Xue and Fu observed a mathematical process that we named originalization during the evolution of gene duplication under recombination, which can explain this suggestion . 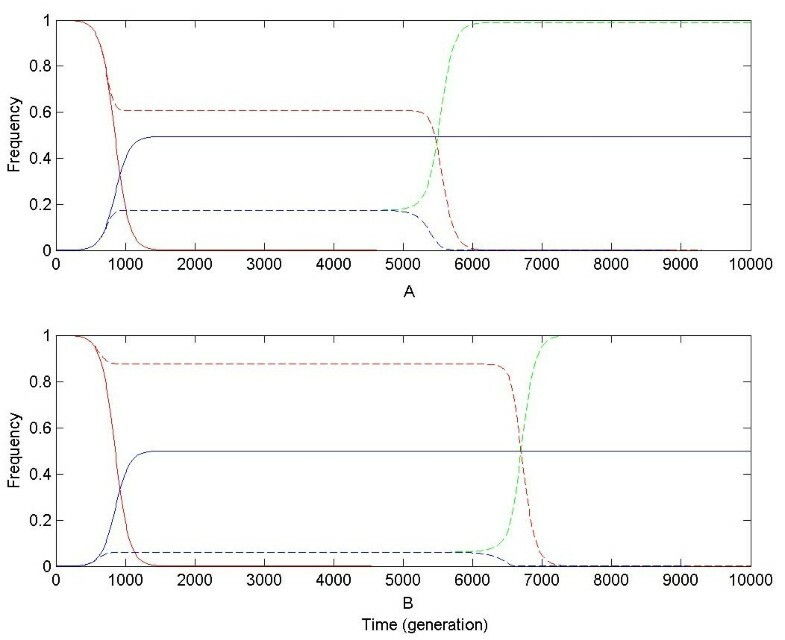 During originalization, under purifying selection recombination results in the higher frequency of the original allele on both duplicated loci, so mean time to nonfunctionalization (Tnon) is prolonged. And it was hypothesized that prolonged Tnon and high frequencies of the wild-type allele might confer the arising and accumulating of advantageous alleles in the population, so that Pneo might become larger [15–17]. In this article, we will test the hypothesis of enlarged Pneo for unlinked gene duplication by originalization, and explore the underlying mechanism. Our results show that under stronger positive selection (Roughly Ns > 0.5) and in larger populations (Roughly N μnon > 0.1) recombination not only enlarges Pneo, but also shortens mean time to neofunctionalization of duplicate genes (Tneo). Therefore, through originalization recombination facilitates neofunctionalization of duplicate genes. Assume that the duplicate genes originated from polyploidization, such as ancient whole genomic duplication (WGD), so that the effects of some genetic forces on small segmental duplications, such as unequal crossing over and gene conversion, are ignored, as assumed in previous theoretical studies on neofunctionalization of duplicate genes [13, 14]. Assume in a random mating, diploid population, chromosomal haplotype is used to represent various genotypes of individuals [15, 16]. Considering advantageous and degenerative mutations, there are three types of alleles at one of duplicated loci: wild-type allele (denoted as a character '0'), degenerative allele (denoted as a character '1'), and advantageous allele (denoted as a character '2'). In this way, there are nine possible types of chromosomal haplotypes in the population, namely, "00", "01", "02", "10", "11", "12", "20", "21" and "22", respectively. We use the DNR (double null recessive or haplosufficient) and haploinsufficient (HI) selective models presented in our previous studies [15, 16]. Under the DNR selective model, individuals with no wild-type allele at both of duplicated loci are invalid (relative fitness is 0), for example, individuals with chromosomal haplotypes "11" and "11", or "12" and "22". Under the HI selective model individuals with at least two copy of wild-type alleles on duplicated loci are valid. Assume mutation rates are the same on the duplicated loci; Transition (or mutation) from original allele to degenerative or advantageous allele is irreversible; Mutations from degenerative to advantageous and from advantageous to degenerative are ignored. Under these assumptions, we report mean time to neofunctionalization (Tneo) under the model only involving neofunctionalization and Pneo under the model involving neofunctionalization and nonfunctionalization (details of the models are shown below). * s is positive selection coefficient. 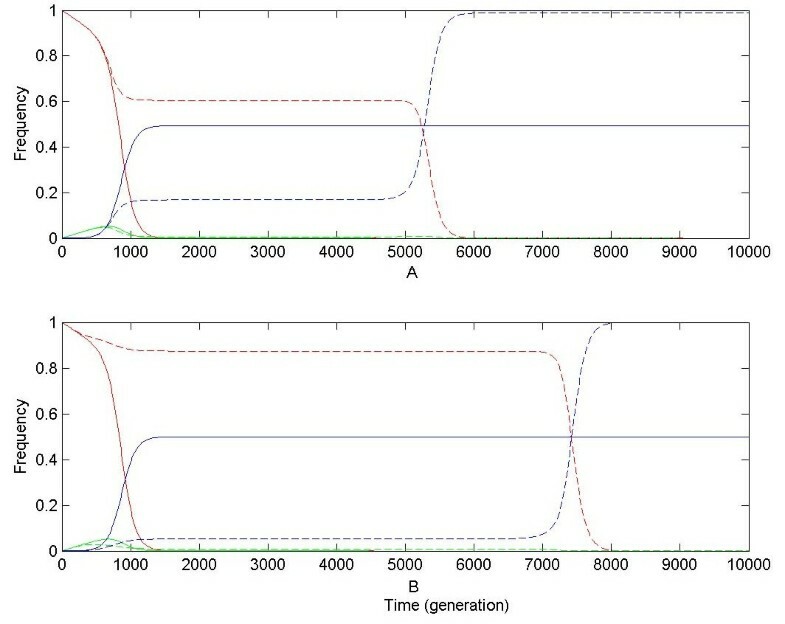 Under the DNR selective model, s1 = 0, while under the HI selective model, s1 = 1.
where w is mean population fitness; r is the recombination rate between two duplicated loci; μneo is the rate of advantageous mutation; under the DNR selective model, s1 = 0, while s1 = 1 under the HI selective model. Based on these ODEs, given μneo = 10-6, dynamic changes of chromosomal haplotype frequencies were numerically obtained by the Runge-Kutta method  given initial conditions x0 = 1, and x1 = x2 = 0; with considering genetic drift (i.e. in an finite population) simulations were also carried out to test the numerical results. In an infinite population dynamic changes of chromosome haplotypes under strong positive selection (s = 0.01) are shown in Figure 1. For linked gene duplication, the frequency of original chromosomal haplotype, x0, decreases nearly exponentially down to 0; x1 and x2 increase continually up to ~0.5. However, for unlinked gene duplication, the behaviors of chromosomal haplotype frequencies are more interesting. Initially, x0 decreases to an equilibrium and then is kept at a high level while x1 and x2 increase also to equilibrium. This equilibrium is kept for a period of time, and then it crashes suddenly, in which x0 drops down to very low (close to 0) suddenly, and so does one of x1 and x2 while another increases up to ~1 (see Figure 1). At neofunctionalization, x1 or x2 are equal to 1, so these numerical results suggest that in finite and large populations Tneo for unlinked duplicate genes might be shorter than that for linked. 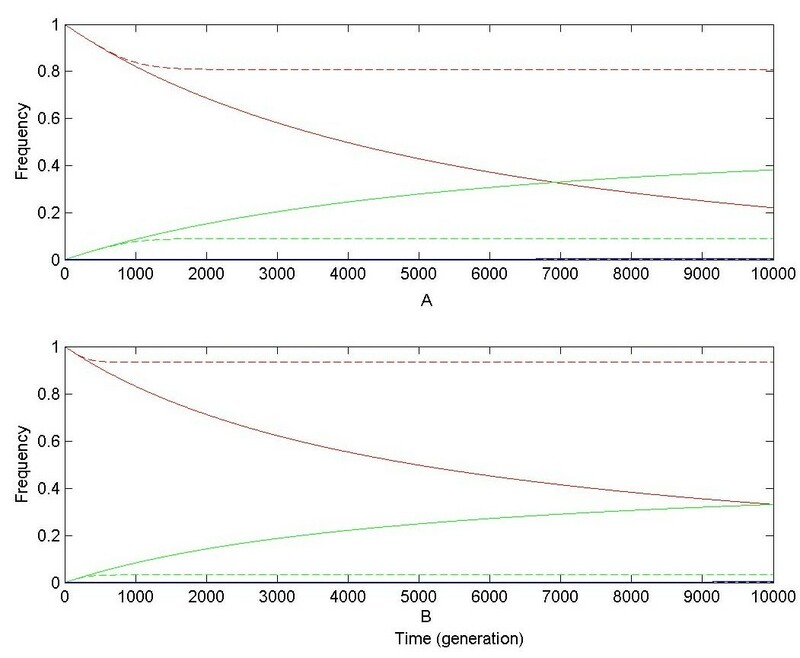 Under recombination high x0 in the population was named originalization , which descirbes the main difference between evolutionary trajectories of unlinked and linked gene duplications (see Figure 1; also see Ref. and ). Therefore, these observations suggest that by originalization, under strong positive selection recombination contribute to shortened Tneo for unlinked gene duplication. Dynamic changes of chromosomal haplotype frequencies for gene duplication during neofunctionalization under strong positive selection. Assume s = 0.01 and μneo = 10-6. In subplot A, are numerical results under the DNR selective model; in subplot B, numerical results under the HI selective model. Solid and dashed curves are numerical results for linked and unlinked gene duplication, respectively. Red, green and blue curves are numerical results for frequencies of chromosomal haplotypes "00", "02" and "20", corresponding to x0, x1 and x2, respectively. In subplots A and B, for linked gene duplication, curves of x1 and x2 are completely coincident. To examine this prediction of shortened Tneo for unlinked duplicate genes in large populations, simulation results in a larger population (N μneo = 0.2) are shown in Figure 2. Of course, similar results are obtained in other larger populations (N μneo > 0.2) (not shown). However, even when N μneo = 0.2, the results sufficiently indicate that Tneo for unlinked duplicate genes is shortened when positive selection is strong (see Figure 2). 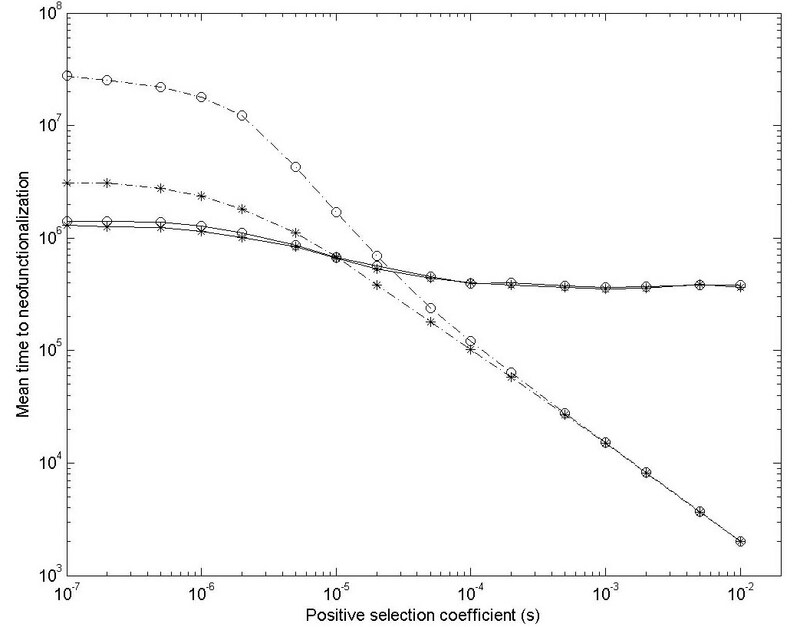 Simulation results for mean time to neofunctionalization of gene duplication with positive selection coefficient. Assume N = 200000 and μneo = 10-6. Star and circle spots are simulation results under the DNR and HI selective models, respectively. Solid and dash-dot lines are simulation results for linked and unlinked gene duplication, respectively. Simulation repeats 3000 times. If s is small enough (or close to 0), the evolutionary behavior of an advantageous mutation is similar to that of a nearly neutral mutation . Therefore, in simulation, when s is small (for example, s = 10-7 in Figure 2) and population size is not small (roughly N μneo > 0.1), Tneo for unlinked gene duplication is larger than that for linked under the either DNR or HI selective model; and Tneo for unlinked gene duplication becomes greatly prolonged under the HI selective model (see Figure 2). These observations are very consistent with those of degenerative mutations in previous studies [15, 16, 20–23]. When s is large (for example, s = 0.01), Tneo for unlinked gene duplication is much shortened and smaller than that for linked (see Figure 2), which is in agreement with above numerical results. In our previous studies [15, 16], we observed that under recombination Tnon can be prolonged in a larger population (roughly N μnon > 0.1); and x0 is kept higher in the population. So prolonged Tnon, shortened Tneo and high x0 might jointly result in larger Pneo for unlinked gene duplication. In order to validate this prediction, direct observations of Pneo are also carried out. Now consider a model involving neofunctionalziation and nonfunctionalization. In the gene pool, there are nine possible chromosomal haplotyes in the population, "00", "01", "02", "10", "11", "12", "20", "21", "22", whose frequencies are denoted as y0, y1, y2, y3, y4, y5, y6, y7, y8, respectively. Fitnesses of individuals with various genotypes are shown in Table 2. Under these conditions, in an infinite population another group of ODEs, just like Equation 3, have been obtained. Their expressions are too lengthy, so they are provided in Appendix. Numerical and simulation methods are the same as those in the above section. Numerical and simulation results were also obtained with the rate of degenerative mutation (μnon) = 10-4 and that of advantageous (μneo) = 10-6. Initially let y0 = 1, and y1 = y2 = y3 = y4 = y5 = y6 = y7 = y8 = 0. Numerical results are shown in Figure 3 and 4. Pneo can be approximately expressed as y2+y5+y8 or y6+y7+y8, and the probability of nonfunctionalization as y1+y4+y7 or y3+y4+y5. Because under the DNR and HI selective model described above, y4, y5, y7 and y8 are quite small and close to 0, Pneo is approximately equal to y2 or y6, and the probability of nonfunctionalization is approximately equal to y1 or y3. So only dynamic changes of y2 and y1 are shown in numerical results as the proxies for the probabilities of neofunctionalization and nonfunctionalization, respectively, and y0 is treated as a proxy of non-resolution (or originalization) . Dynamic changes of chromosomal haplotype frequencies for gene duplication during resolution (neofunctionalization and nonfunctionalization) under slight positive selection. Assume μneo = 10-6, μnon = 10-4, and s = 10-6. In subplot A, numerical results are obtained under the DNR selective model; in subplot B, numerical results under the HI selective model. Solid and dashed curves are numerical results for linked and unlinked gene duplication, respectively. Red, gree and blue curves are numerical results for frequencies of chromosomal haplotypes "00", "01" (or "10") and "02" (or "20"), corresponding to y0, y1 and y2, respectively. In subplots A and B, for linked gene duplication, curves of y2 are nearly coincident with x-axis. Dynamic changes of chromosomal haplotype frequencies for gene duplication during resolution (neofunctionalization and nonfunctionalization) under strong positive selection. Assume μneo = 10-6, μnon = 10-4, and s = 0.01. In subplot A, numerical results are obtained under the DNR selective model; in subplot B, numerical results under the HI selective model. Solid and dashed curves are numerical results for linked and unlinked gene duplication, respectively. Red, green and blue curves are numerical results for frequencies of chromosomal haplotypes "00", "01" (or "10") and "02" (or "20"), corresponding to y0, y1 (or y4) and y2 (or y6), respectively. In subplots A and B, for linked gene duplication, curves of y1 are nearly coincident with x-axis. When positive selection is slight (s = 10-6), for unlinked gene duplication, an equilibrium is quickly reached for y0, y1, and low-level y2, while for linked duplication, y0 continually decrease with increasing y1 and very low (close to 0) y2 (see Figure 3). These indicate that under weak positive selection high frequency of original allele and low frequency of advantageous alleles are both buffered on unlinked duplicate loci in the population. When positive selection is strong (s = 0.01), for linked duplication, y0 decreases exponentially down to be very low (close to 0); and y2 increase continually up to ~0.5. However, for unlinked gene duplication, y0 is only kept high for a period of time and then crashes while y2 increases suddenly up to be very high (~1) (see Figure 4), which is very similar to observations in Figure 1. These results, combined with results in the above section and in our previous studies, including high y0 and sudden increase of advantageous allele frequency at one of duplicated loci in the population (see Figure 4), prolonged Tnon[15, 16, 20–23] and shortened Tneo (see Figure 2), jointly suggest an increase of Pneo for unlinked gene duplication in finite populations. In finite populations, there are several features in simulation results of Pneo. First, under strong positive selection, when N is small (roughly N μnon < 0.1), Pneo for unlinked gene duplication under both DNR and HI selective models are all close (see Table 3), and similar to Walsh's prediction - μneo/μnon[13, 14]. However, when N is larger (roughly N μnon) > 0.1), both predictions from Equation 1 and 2 are different from our observations under the DNR selective model in simulation (see Table 3). * Other genetic parameters are μneo = 10-6, μnon = 10-4, and s = 0.01. Simulation repeats 5000 times. DNR_LINK and DNR_FREE are simulation results on linked and unlinked duplicated loci under the DNR selective model, respectively; HI_LINK and HI_FREE are simulation results on linked and unlinked duplicated loci under the HI selective model, respectively; Eq_1 and Eq_2 are predictions from Equation 1 and 2 of Walsh (1995), respectively. Second, in a given larger population (N μnon = 0.5), simulation results of Pneo with positive selection coefficient (s) are shown in Table 4. If s is small (roughly Ns ≤ 0.1), Pneo for unlinked gene duplication under the DNR selective model are also close to Walsh's prediction - μneo/μnon. If s becomes larger (roughly Ns > 0.5), Pneo becomes different from expectations from Equation 1 and 2; and Pneo for unlinked gene duplication is larger than that for linked under both the DNR and HI selective models (see Figure 4). Therefore, these observations indicate that Equation 1 and 2 don't provide good approximations of Pneo for unlinked gene duplication under stronger positive selection; and free recombination (r = 0.5) enlarges Pneo, which is quite consistent with observations of Pneo in Table 3, in addition to numerical expectations and suggestions in our previous studies . * Other genetic parameters are μneo = 10-6, μnon = 10-4, and N = 5000. Simulation repeats 5000 times. DNR_LINK and DNR_FREE are simulation results on linked and unlinked duplicated loci under the DNR selective model, respectively; HI_LINK and HI_FREE are simulation results on linked and unlinked duplicated loci under the HI selective model, respectively; Eq_1 and Eq_2 are predictions from Equation 1 and 2 of Walsh (1995), respectively. Third, these observations of Pneo were obtained under two extreme conditions: linked (r = 0) and unlinked (r = 0.5). However, in most real cases 0 < r < 0.5, so Pneo with these conditions are also simulated, and results are shown in Figure 5. Simulation results clearly show that as r is larger, Pneo becomes larger under both DNR and HI selective models. This reinforces our conclusion that recombination enlarges Pneo under strong selection. 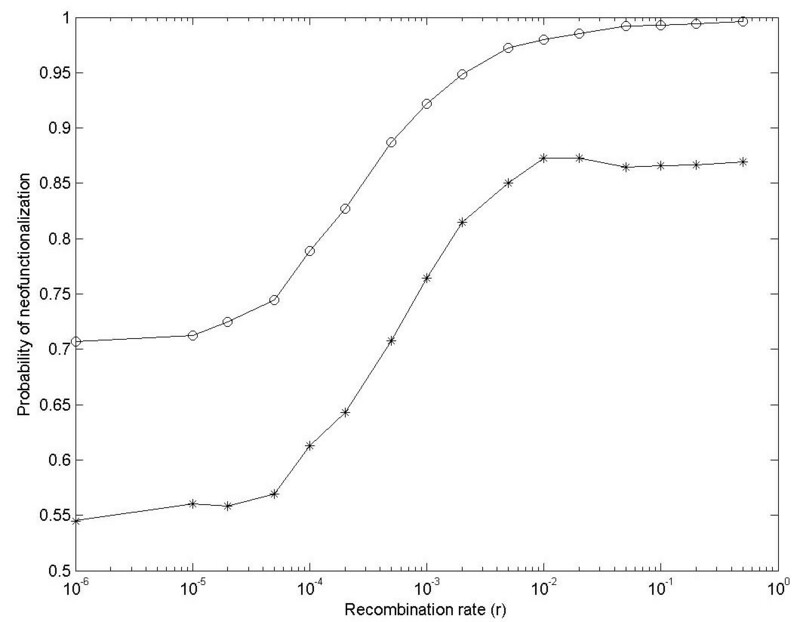 Simulation results for the probability of neofunctionalization for gene duplication with recombination rate. Assume N = 5000, μneo = 10-6 and μnon = 10-4. Star and Circle spots are simulation results under the DNR and HI selective models, respectively. One might argue that these parameters used in above analyses are not realistic enough, for example μneo = 10-6, or μnon = 10-4 and μneo = 10-6. They also can be changed into other more realistic values, for example μnon = 10-6, and μneo = 10-9[13, 14, 23], but these changes do not influence conclusions obtained above except for much prolonged time for calculations. The sudden crash of the balance of chromosomal haplotype frequencies for unlinked gene duplication in numerical results shown in Figure 1 and 4 might be criticized to result from numerical tolerance. But Pneo and dynamic changes of genotypes observed directly in simulation are quite consistent with predictions from numerical results. In our previous studies, it has been observed that high x0 at the equilibrium can be broken by genetic drift in finite populations [15, 16]. In this study this balance can also be broken by strong positive selection. According to our theoretical results presented in this study and previous studies, several views on the evolution of gene duplication should be revised and reconsidered. 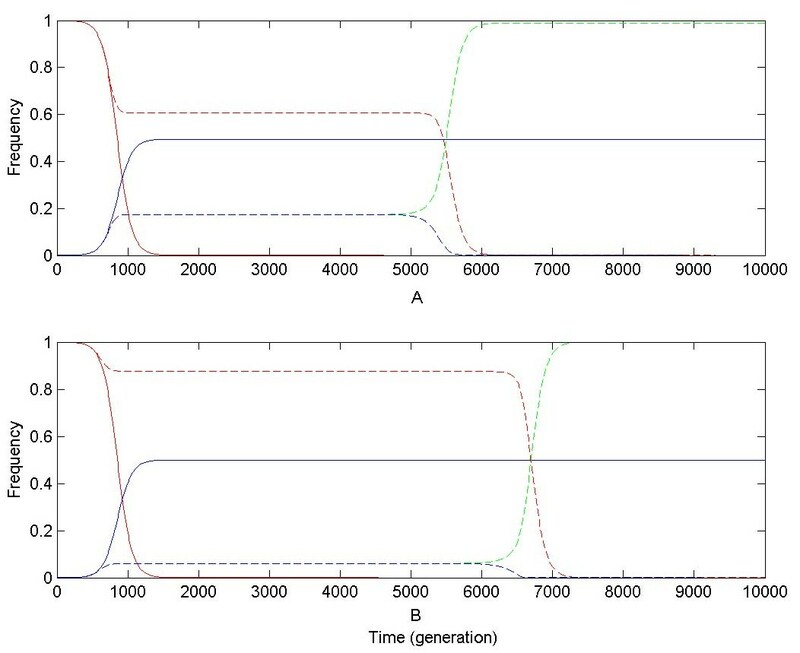 It was commonly considered that for gene duplication, mean time to nonfunctionalization is a few million generations or less (assume degenerative mutation rate is ~10-6) . In light of our results, this view should be revised. Only in small populations (N μnon ≤ 0.01), can mean time to nonfunctionaliztion be simply estimated to be on the order of the reciprocal of degenerative mutation rate for gene duplication - ~ 1/(2 μnon) [20, 22, 23]. However, it increases when population size is larger (roughly N μnon > 0.1), especially for unlinked gene duplication [15, 16, 20–23]. For unlinked haploinsufficient gene duplication, Tnon is prolonged dramatically even in a modest population (0.1 < N μnon ≤ 1) [15, 16]. The underlying mechanism is that under recombination the frequency of original (or wild-type) allele is kept high at both duplicated loci, which is a mathematical process and was named originalization [15, 16]. High frequency of original allele (x0) in the population retards nonfunctionalization apparently, because at nonfunctionalization x0 must be 0. In nature populations, population sizes are usually not small (i.e. Ne from bacteria is about 108~109, Ne from yeasts is 107~108, and Ne from mammals is about 104~105) , so Tnon is usually larger than expected in previous studies (~106 generations). Homogenization is often argued to originate from gene conversion. However, in this study, it is observed that under recombination originalization can also result in homogenization. This result is obtained from the principles of traditional population genetics, under a theoretical framework completely different from gene conversion. In our previous studies on originalization, the effect of gene conversion was neglected. Moreover, in originalization, the wild-type allele is buffered with high frequency on both duplicated loci, which retards the divergence of duplicate genes, while in gene conversion, it is not certain that the wild-type allele is converted on duplicated loci. And during gene conversion, dn (the rate of non-synonymous nucleotide substitution) and ds (the rate of synonymous nucleotide substitution) of duplicate genes are both small. However, in originalization, under purifying selection, dn of duplicate genes are small while ds are large. This prediction might be applicable to distinguish the effect of originalization from that of gene conversion on genomic evolution. The rate of degenerative mutation is usually much larger than that of advantageous mutation. So under neutrality, the probability of fixation of advantageous mutations at a locus is much smaller than that of degenerative mutations. This prediction is still hold on for gene duplication under weak selection [13, 14]. As shown in Equation 1 from Walsh (1995)  and our simulation results (Table 3), for slightly positive selection (Ns < 0.5), Pneo is equal to ~μneo/μnon, regardless of recombination. However, under strong positive selection, in larger populations (N μnon > 0.1) Pneo becomes larger under recombination than that under linkage (see Table 3; and Ref. ). The underlying mechanism is that recombination provokes the loss of degenerative mutations and the maintenance of wild-type allele at both duplicated loci in the population. The high frequency of wild-type allele facilitates the arising and accumulating of advantageous mutation, so Pneo is enlarged. In this way, the power of positive selection is amplified under recombination. When the evolution of gene duplication is considered in relation to population subdivision (even speciation), the conclusion of Pneo enlarged under recombination can be reinforced. When advantageous mutations are slightly selective, each of them is buffered in the population at a low frequency for a prolonged period under recombination by originalization. If environments under which subpopulations live are changing and different, they might provide different strong positive selections, under which advantageous alleles might quickly be fixed at the duplicated loci in subpopulations because of shortened Tneo. Therefore, Pneo of duplicate genes in nature populations might be larger than expected before. At the genic level speciation is a differential process accompanied by differential adaptations . It has often been argued that genomic rearrangement resulting from random loss of duplicate genes might cause passive reproductive isolation and then speciation [3, 20, 26]. Here our results further suggest that via originalization different kinds of neofunctionalizations for duplicate genes among subdivided populations might also contribute to speciation. Methods of simulation and numerical analyses have been described in detail in our previous studies [15, 16]. where r is recombination rate between duplicated loci, s is positive selective coefficient, μneo is advantageous mutation rate and μnon is degenerative mutation rate. CX conceived of the study, carried out the most works, and drafted the manuscript. YXF participated in the design of the study. RH and SQL performed some simulation works. All authors read and approved the final manuscript.